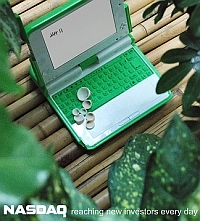 Currently, the XO laptop from OLPC does not have spreadsheet software. The One Laptop Per Child developers did not think there was a need for it when they designed the initial Sugar activities, and to an extent, they are right. One of the most engaging project that has involved both students and parents is the family accounting initiative. For six years, many families have recorded their income and expenses in order to better manage their spendings. It was originally done using a simple balance card written on paper. Later, many had switched to Excel (via desktop PCs at the school's computer lab and the help of their children). It was a case where the benefits of technology was clear and well appreciated. Thus, having a spreadsheet on the XO has been one of the most widely requested features from the parents. Being able to do their accounting at home through the help of their children is extremely attractive. Manusheel Gupta is investigating options for building a spreadsheet activity for the XO. Python-powered spreadsheet (PPSS) seems to be a good choice for integrating into the Sugar environment, while perhaps pulling in some features from GNumeric. Eben Eliason will be discussing the ideas on the UI of the spreadsheet during the coming week. If they want a spreadsheet program, they should just use Google Docs. That'll give them a word processor, spreadsheets, and presentation tools. Given its ease of use, coupled with amazing power, it might just be the best solution. Not only is the spreadsheet good for math, but I think it can go a long way toward learning about science. Teaching kids to be prodigious in recording and organizing even simple data (e.g. recording the temperature at fixed intervals over a period of time) can go a long way toward their education. A teacher can then ask questions like: what was the high and low for a day, week, month, etc. more advanced students can use it to learn about averages. Even in grade school, when teachers would put gold stars next to your name on the poster board was a type of spreadsheet. The potential uses are far reaching. Making the spreadsheet interface "fun" or "kid friendly" would be a good challenge for software development. Overall, I think "built in" spreadsheet capability would be a big Value Add for the XO. @Michael, I wouldn't assume that these users would have constant Internet access. I don't know whether it works on Linux (I think it'll work through Mono), but it might be worth checking out Resolver. It's a full Python-based spreadsheet where everything - even the formulae in cells - are rendered into a Python program. Despite the lack of (normally) things such as charts, it has pretty much replaced OO and Excel for me. Oh yes, and it's open source friendly. I hope that this "sudden" need for a spreadsheet function causes some people to re-think their view that computers used for educational purposes have no functional overlap with computers used for other purposes. I guess in real life the computer will be used as a family resource as well as the child's exclusive personal property. Hmm. Perhaps they can try out wikicalc online spreadsheet (opensource, check out http://wikicalc.org/products/wikicalc/index.html), running in it's hosted mode (running on the OLPC natively). It's not just as a spreadsheet, but can be a collaborative structured content creation platform too. Check out the page above where they show how a wikicalc spreadsheet can emulate an IBM.com 'investor relations' page. Learning children, and their families, how to handle a spreadsheet will also go a long way in helping them to balance their budgets. Not only rich people are constantly wondering where their money goes. Even a simple spreadsheet with dates when payments are due will help enormously. A small educational program about household budgets will be very enlightening. All humans are bad at understanding interest payments. A spreadsheet can show you immeditately what you really pay on your debt. This is something children cannot learn early enough. "The One Laptop Per Child developers did not think there was a need for it"
This kind of statement shows how little pedagogical thought went into OLPC. Spreadsheets are probably the most used technology for teaching math outside of a simple calculator. There is a etoys app called "skeleton". This is a spreadsheet program. (a interactive geometry software) in the .xo format. May be the skeleton app could be next one. There are many application that could/would/should be put on the XO. However we need to remember the drive is 1gig- Since Google doc's are on-line it makes good sense to use those. Using on-line tools saves storage space. Actually this week's OLPC news mentions the start of a port of Gnumeric (free as in speech *nix spreadsheed) to Sugar. Oh, and Dr.Geo II, an Interactive Geometry program made in squeak, has been bundled into an instalable .xo and placed on the Activities wiki page (http://wiki.laptop.org/go/Activities ) yesterday. It will only work on >=Update.1 builds though (in release candidate stage at the moment). You can go into the Terminal and install Gnumeric: "yum install gnumeric" then to run it, go into the Terminal and type "gnumeric". Most of the fonts seems small. I find it hard to read. Superficially, it seems to work fine. So does Maxima if you'd like to use a symbolic math package ("yum install wxMaxima" then to start the program type "wxmaxima"). Another approach to developing a spreadsheet activity is to begin from the GNumeric code base. Manu is working with Jody Goldberg and Eben Eliason to port a simple version of GNumeric to the Sugar environment.